Ismailis are a vital part of the Ontario society says Premier McGuinty! January 12, 2010 – Ontario Premier Dalton McGuinty says the Ismaili community has played an important role in shaping the strong and dynamic society they enjoy today. In Ontario, the premier said, they value the diversity that breathes life into the province. 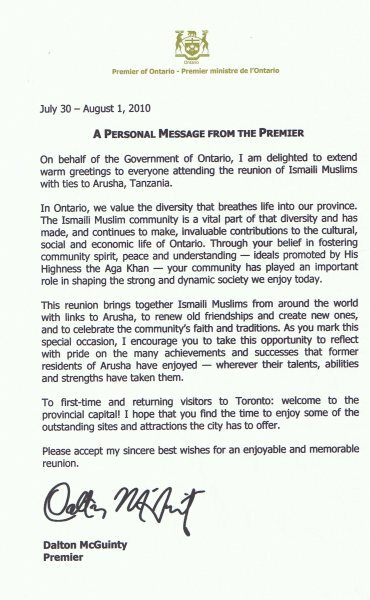 Premier McGuinty’s comments are contained in a special message sent for the reunion of Ismailis with ties to Arusha, Tanzania. The three-day reunion – the first ever – will be held in Toronto from July 30 to Aug. 1, 2010. About 300 Ismailis from around the world are expected to attend the historic reunion celebrations in Toronto and Mississauga this summer. Many Ismailis from Arusha settled in Canada in the early 1970s. Since settling in their adopted country, they have been productive citizens, working for the government and the private sector. Others have successfully ventured into businesses. Sultan Jessa, chair of the 2010 Arusha Reunion, said three main events for the reunion include a meet-and-greet icebreaker, a formal gala banquet and a barbecue and picnic. “This is a wonderful opportunity for former Arushawallas to get together and to renew old friendships,” he said. Noor Gillani, also co-chair, said the reunion is also an opportunity to create new friendships. “Some of us have not seen each other for 30 to 50 years,” Gillani said. Both, Jessa and Gillani urged all former Arusha residents to make a special effort to attend the reunion. have the fun part soon! Arusha was always the Best! Looking forward to the event and meeting everyone. Next time the reunion should take place in ARUSHA itself so as the New Arushawallas can meet the Old Arushawallas.